Announcing the release of the second EM Cases eBook! 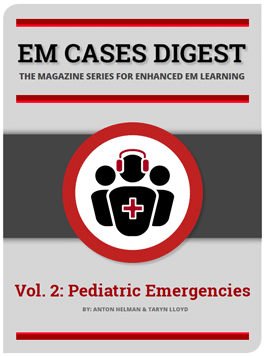 After the great success of our first eBook in 2015 with more than 4000 downloads, and after a year of hard work of a fantastic team of 15 people, we’re excited to release the 2nd interactive FOAMed eBook ‘EM Cases Digest Vol.2 Pediatric Emergencies’. This easy-to-navigate eBook contains cases, Q & As, links to useful resources, rapid review questions and more, all based on the pediatric EM Cases podcasts published to date. It includes chapters on everything from sepsis to pediatric POCUS. Peruse the book and download your free copy on the eBooks page here. Hey Anton, thanx for your incredible med-education. Quick question: paeds sepsis digest you guys incl intubation with consideration of Atropine as premedication. Would you consider Atropine in that cerebral oedema child in DKA that you also have to Intubate ? Atropine is optional for Pediatric premedication in intubation. There is only observational data for improving admission to hospital. For those pts who you anticipate bradycardia, I would recommend it. For cerebral edema, if Cushing’s response a possibility, then I would recommend it. Remember to use 0.02mg/kg as lower doses have been associated with worse outcomes.